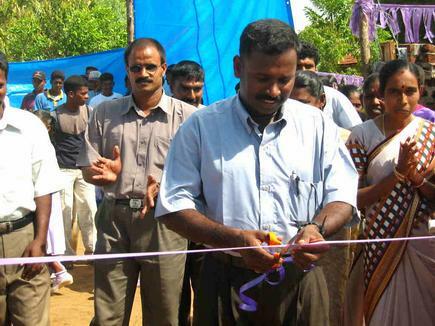 "Samurdhi sponsored development projects play a vital role in the economic progress of our district and for creation of self-employment opportunities," said E. Kausalyan, Batticaloa-Amparai Head of the Political Wing of the Liberation Tigers, when speaking Saturday morning at the opening ceremony of the Trade exhibition organized by the Kiran Pradeshya Sabha in Batticaloa district. Ms. Vasuki Arulrajah, Secretary at the Kiran Predeshya Sabha presided the event. Batticaloa-Amparai Head of Administration of the LTTE, Prabha, Head of Economic Development Wing, Nizam, and Kudumbimalai Head of Political Section, Jeya, and several other LTTE officials attended the opening ceremony and viewed the exhibits. "While other ther countries in the globe are continuing to make industrial advances, our district has suffered from impact of two decades of war ending up with a badly shattered economy. "All of us should work together to build our economy to a level where we can compete with other world markets. Our youth should participate in the cottage industries, self-employment projects organized by the Samurdhi Authority and learn the habit of saving," Kausalyan further said in his opening remarks.